The ability for avatars to jump. Avatar selection, editing, skin and clothing updates. As with the majority of Sansar deployments, this update requires the automatic download and installation of a client update, particularly as it involves changes affecting the Sansar avatar system. Quests are a part of Sansar’s emerging game building / game play capabilities. 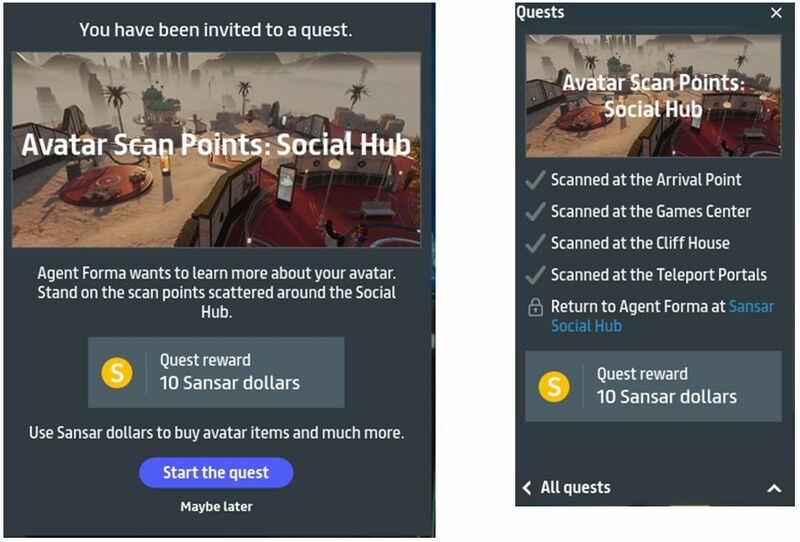 Quests are seen as being both a means to help on-board new users to Sansar, by giving them things to do, and as a means of providing a capability that can allow greater gaming and questing in Sansar experiences as a whole, using common root functionality, thus helping to give a feeling of continuity between experiences. For this initial pass of the system, quests can only be created by Linden Lab. However, over time, the capability will be opened up to experience creators. The quest system is immediately obvious on logging-in to Sansar, with a Quest pop-up displayed as you arrive in your Home Space. Further, two initial quests are provided at the Social Hub. The two Social Hub quests are fairly basic. Each offers a modest reward of S$10 for exploring the Social Hub area and either walking over, or touching (left-click in Desktop mode) objects located at various points. Each quest is triggered by touching one of two glowing stands (Agent Animus and Agent Forma) in the centre of the arrival area of the Hub. Doing so triggers a pop-up describing the quest, which includes options to start the quest or defer it (Maybe Later) – shown below left. Starting the quest then switches the pop-up to display the required objectives and how to complete the “mission” (below right). As objectives are achieved, thy are briefly highlighted, and the grey-out tick mark alongside them is illuminated. Neither of the quests is procedural (so you don’t have to complete the objectives in the listed order), and at walking pace they take about 3-5 minutes to complete. With all objectives completed, returning to the initiating Agent and touching it will update the quest status and deliver your S$10 reward, together with a link to open the Sansar Store, should you want to buy something. Currently, there is no limit to how many times you can take each quest, and one user I was with while trying things out claimed to have already gone through both a total of 10 times apiece. The Quest and Jump release provides a number of avatar related updates and changes. Jumping: Sansar avatars can now jump. I’ve no idea how this is triggered in VR mode because – at the time of writing this overview – the release notes started with the words “Questing. Jumping. Styling for your custom avatars”, then never actually mentioned how to jump. For those in Desktop mode, it’s a matter of pressing the keyboard space bar. The jump animation is basic, but it works. Custom Avatar dressing: it is now possible to dress custom avatars from the Look Book – providing they have been built with this in mind. 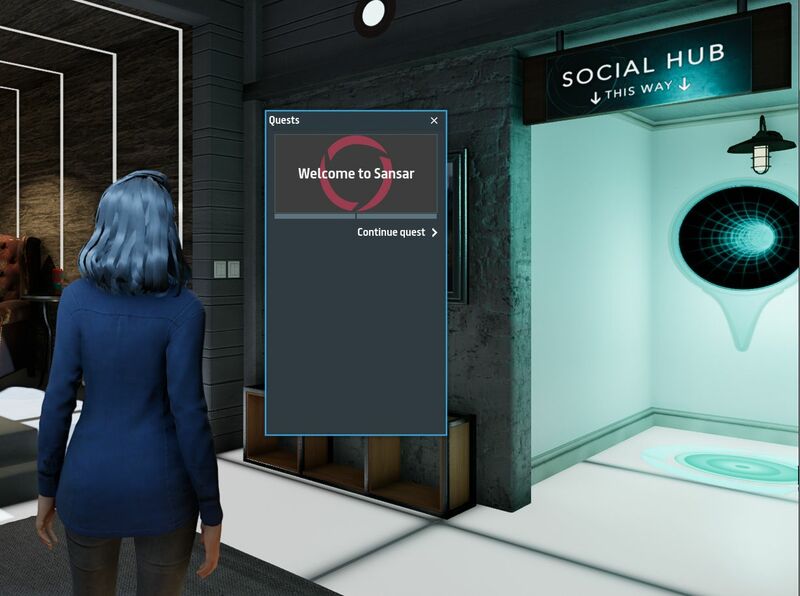 Custom Avatars as starter avatars: new users can now opt to use one of a number of custom avatars (as well as the Sansar default avatars) when starting out. Marvelous Designer library clothing: the Look Book inventory now includes a rang of Marvelous Designer clothing options – look for the yellow “M” tag. The clothing library now includes adjustable MD clothing options (indicated by a yellow “M” tag). Use the VR controllers or CTRL-left- click and drag for Desktop mode to adjust when the clothing item is selected. Skin colours / tones: more options to colour the skin’s base tone. Improved save options without being kicked out of the editor. Better reset options to allow you to re-start adjustments from scratch. Easier way of returning to the world and return to your previous position in world before you edited your character. (Saving user position in runtime). Events can no longer be joined by finding an experience, it must be done via the event calendar, with the event itself a special copy (not an instance) of the experience. Active events are listed on a new Featured tab – Client Atlas only. Event creators can change the scene tied to an event, customise the scene like any experience, and delete the experience if it’s no longer needed. When you choose to teleport to your friend, you will now spawn near them, unless the experience creator has opted to disable direct teleport and force you at the arrival point. You can now create Portals more easily with the new “Create Portal” button on the Atlas details page – Client Atlas only. No more folders. Existing folders are converted into parent objects. Moving/Scaling a parent object will move/scale children along with it. Move/rotate/scale a selection of multiple objects at once. List<> support in script parameters: allows passing multiple values to a script as a single parameter. This means that creators can now assign multiple values such as a sound, object, a position point to one parameter, eliminating the old behaviour that forces the creator to utilise a parameter per value. Interaction behaviour on a per user basis: creators can now set interactions to update and change behaviour on a per-user basis. This enables creators to disable content once a user interacts with it. For example, a glowing chest in a treasure hunt could stop glowing once the user interacts with it. It will be interesting to see how the quest toolset progresses. They are basic, but functional and were drawing a lot of attention following the release deployment. 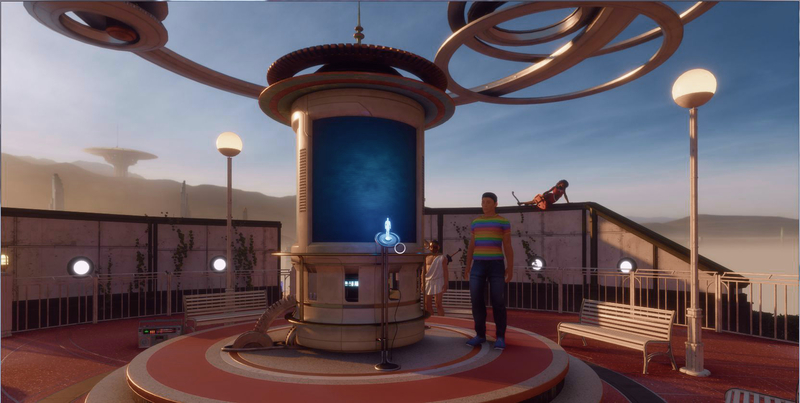 The addition of the MD clothing to the library is a welcome update, but while the button for spawning teleport portals is a step forward, Sansar would benefit from a means for users to be able to add experiences to some form of client “favourites” then can quickly access without having to pull up the Atlas, search it, click on an experience description then click on the button to spawn the portal. This is, frankly, as clunky as having to do the same and then click the Copy URL button and paste the URL into chat. For the list of known issues, please refer to the release notes. For scripting API updates, please refer to the API documentation.